Not open to the public -- we do not yet own our own winery. The Snowden ranch lies on the eastern slopes of the Napa Valley overlooking the towns of Rutherford and St. Helena. Premium wine grapes have been farmed on the property since it was homesteaded in 1878. The Snowdens came to the property in 1955 and thus far three generations have actively participated in tending the vineyards. The family began producing its own wines in 1993. Diana Snowden Seysses became the winemaker commencing with the 2005 growing season and continues in that role today. All Snowden wines are produced exclusively from fruit grown on the property. 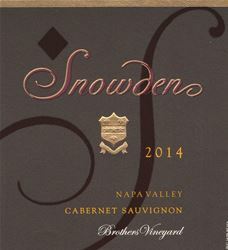 To join the wine club, visit www.snowdenvineyards.com or call 707-963-4292. Members of the email and postal maiiling lists are entitled to various benefits including a discount on direct purchases. Annual case purchase subscriptions are also available. For more information, visit the website at snowdenvineyards.com. For purchases of six bottles or more, Napa County residents will receive a 20% discount and free delivery to street addresses in Napa County.